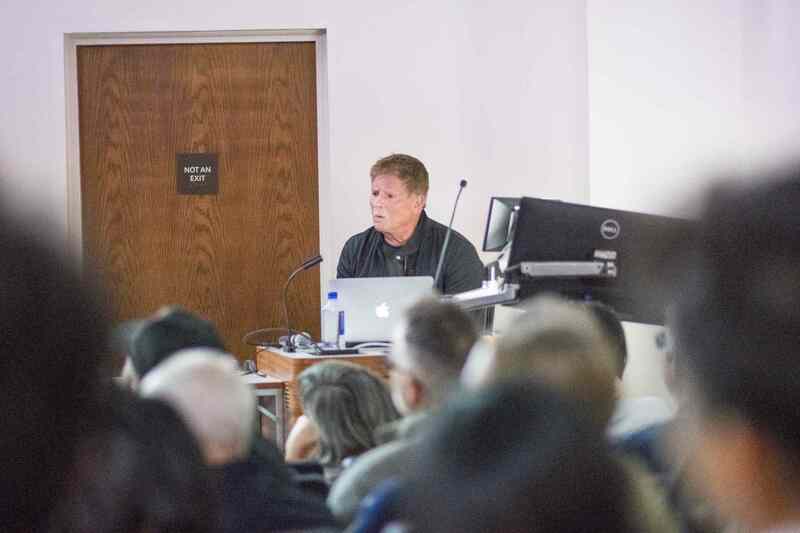 In a lecture at Watt Hall Wednesday, renowned architect and adjunct professor Lorcan O’Herlihy spoke about his exhibition “Amplified Urbanism” at the Harris Building in downtown Los Angeles. USC adjunct professor Lawrence Scarpa delivered introductory remarks, acknowledging O’Herlihy’s award-winning architecture and design company, Lorcan O’Herlihy Architects, for completing over 100 projects across multiple continents. Upon taking the podium, O’Herlihy credited his childhood love for cities like Rome and London as the reason he became an architect. Growing up in Dublin, O’Herlihy said his father’s career as a film actor allowed him to travel the world. “Sometimes it’s really about where you come from or what you like personally,” O’Herlihy said. After settling on the East Coast for eight years to work for Kevin Roche and Steven Holl, among others, O’Herlihy took on the project of designing the Louvre Museum in Paris. Several years later, he moved to New York to immerse himself in the ’80s contemporary art scene where he briefly pursued a career as a painter, a phase he said was very formative in his architectural career. O’Herlihy then went on to discuss several urban projects he’s pioneered over the last several years, but prefaced this with the philosophies he always applies to his projects. O’Herlihy cited the current digital climate as another major challenge for architects — he believes that social media is a public space. Because of this, he seeks to foster a “third space,” which he views as connective tissue between the private and public spheres. “It should be across the board … it doesn’t matter where the resources are,” O’Herlihy said. Throughout the lecture, O’Herlihy emphasized that he views projects through social, artistic, political and economic lenses. Following the lecture and subsequent Q&A session, attendees moved to the Verle Annis Gallery to enjoy refreshments and view the exhibition, which will be on display until Nov. 16. The post Lorcan O’Herlihy opens up about ‘Amplified Urbanism’ appeared first on Daily Trojan.